The Tampa Bay Buccaneers made a major change at tight end this week, trading Kellen Winslow II to the Seahawks for a conditional late-round pick and signing former Colt Dallas Clark. We break down the reasons behind the move and how Clark fits in with the Bucs – and why rookie RB Doug Martin may be the unseen reason behind the move. Click here to read all about it. What will Andrew Luck’s offense look like? For National Football Authority, we break down the offense the Indianapolis Colts are designing for Andrew Luck. 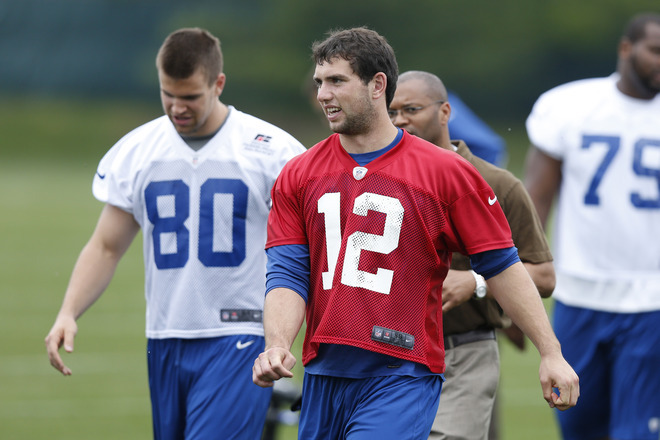 How will the Colts feature rookie tight ends Coby Fleener and Dwayne Allen? What receivers will become Luck’s favorites? Click here to read all about it. Is Jim Irsay Tweeting Colts draft strategy? For National Football Authority, we try to break down Indianapolis Colts owner Jim Irsay’s Tweets (key word: try) to see what it tells us about the franchise’s draft strategy. Click here to read all about it. How seriously are Colts considering RG3? For National Football Authority, we break down recent rumors that the Indianapolis Colts may prefer Robert Griffin III to Andrew Luck with the first overall pick. Is RG3 moving above Luck, or are the rumors just the typical pre-draft noise? Click here to read all about it. Can Colts land Coby Fleener? For National Football Authority, we break down whether the Colts can will have enough luck (sorry) to draft Stanford TE Coby Fleener at the beginning of the second round. If the Colts can’t pair Fleener with his college quarterback Andrew Luck, who is the other tight end option worth consideration? Click here to read all about it.